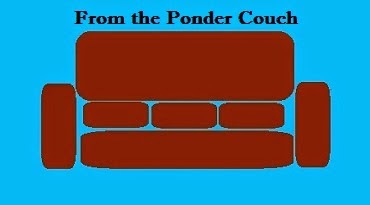 From the Ponder Couch: 5 Commercials From My Childhood That Have Stuck With Me! 5 Commercials From My Childhood That Have Stuck With Me! Here are 5 commercials I saw in my childhood that have stuck with me. This commercial is random. It's part of the reason I started liking random things so much, I think. This and the cartoon short "Now Hear This!" Another wonderfully random commercial! I dig the spoken-song thing. 3. Who Put the Straw in My Hi-C Fruit Drink? This is one of the first times I heard a song in a commercial and realized it was a reworded version of a song I knew. This kinda set me on the path to writing "Santa Buddy". 4. That's a Blow Pop! I don't know why this one has stuck in my memory. I do like the "What?! What?! Cut cut..." part. This commercial helped me make it through 16+ years of sitting through classes. I don't know that I would've graduated at all if I didn't have doodling in my boredom toolkit. My doodles have never come to life, though. Anybody want to hire me to write some odd commercials to inspire the next generation?